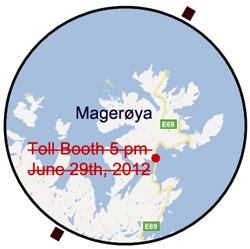 In the current situation, the undersea tunnel to Magerøya is fully financed on June 29th, 2012. There will be no toll fee beginning 5 pm June 29th. The general manager at Nordkapp Bompengeselskap AS, Mr. Werner Hansen, says that the increase in traffic has accelerated the payment schedule with two years. The tunnel was opened on June 15th, 1999, and the plan was to collect toll from cars using it for the following 15 years. The total cost for this major road project was NOK 1 Billion. The Norwegian parliament, Stortinget, decided that a NOK 210 million loan was to be financed with the toll. The toll fee has been equal to the old ferry fare. As early as the 1930s there was an idea of connecting Magerøya with the main land with an undersea tunnel. In the 1980s people like Mr. Sigurd Berg-Hansen worked on materializing the idea. On May 28th, 1993, 88 legislators voted yes against 13 no's in the Stortinget to pass the constructing of Fatima (Fastlandsforbindelse til Magerøya). The Minister of Transportation Mr. Kjell Opseth dug the first shovel in September later that year. The whole road - including the new road, three tunnels and four bridges - was completed in 1999. The undersea tunnel is the northernmost project of its kind in the world. It is the third longest undersea tunnel in Europe. The tunnel is 6.8 km long, the deepest point is 212 meters below sea level and there is at least 50 meters of solid rock above the tunnel. An undersea cave at the bottom of the tunnel will take weeks to fill, in case a power failure stops the draining of a leaking tunnel. The tunnel is equipped for receiving radio and cellular phone signals. In both ends of the tunnel there are garage doors for keeping the cold out. They automatically close when the temperatures drops below a certain temperature. This way no ice will develop inside the tunnel. The ice could, in time, crack the rock and damage the tunnel. In the winter drivers should drive close to the sunk garage door with the red lights. This triggers a detector to open the door and give you green light to proceed. Pictures on our Flickr site showing the winter garage doors in the tunnels.